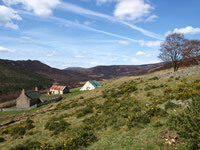 The restoration of the hingin lum cottage and horsemill at Auchtavan in 2008 by Braemar Community Limited was made possible by funding from the Heritage Lottery Fund, Historic Scotland and Cairngorms Leader. 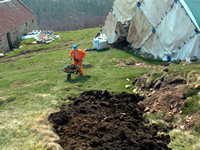 When it was time to start work on site the weather and livestock had turned the approaches to the site into a sea of mud and the first job was to rid the area of water and stop the animals using the buildings for shelter. 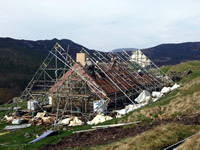 Having seen the damage that the wind was doing and the precarious state of the cottage, the consulting engineer designed a tent to cover the whole building which would prevent further damage and allow the builders to work under cover in all weathers. 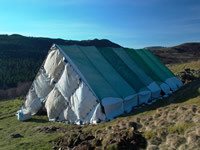 Once erected the tent had to be securely anchored down and this meant the sheeting was fastened to the scaffolding with masses of substantial cable ties and the edges pinned to the ground with large rocks. 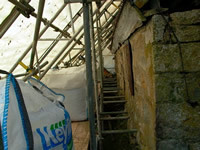 Inside the canopy a staging was erected all-round the base of the frame work and these were weighed down with large aggregate bags full of road ballast which would be used to fill in the floor of the horse mill and pot holes in the road when the tent was removed. 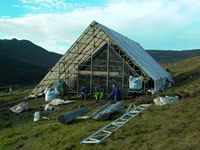 The work to put up the tent and get the site ready for the conservation repairs was completed in November 2007 in a period of brilliantly sunny weather. This made the few visitors that Auchtavan got at that time of year wonder why this rather un appealing structure had been installed. 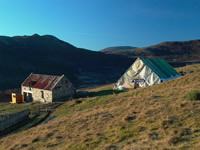 It was not long before the tent was subjected to a fierce gale and although everyone had confidence in their work there was considerable relief when the project manager reported that it was still in place and absolutely undamaged. 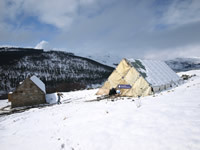 The tent was soon to become a familiar landmark and it attracted many visitors to see it at close quarters. It was to remain closed up securely until the funding and permissions were all in place another nine months of anxious waiting. 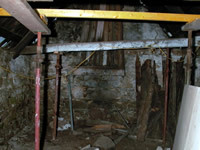 As soon as the green light was given to begin the restoration, a team of archaeologists moved in to survey the interior of the cottage and record what was there. 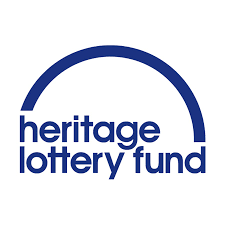 As expected there was little in the way of artefacts remaining apart from a pair of sheep shears and a clay pipe. 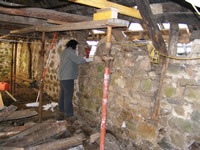 After the archaeologists moved out a team of volunteers from Braemar Community Ltd set about removing the evidence of many generations of sheep having resided in the cottage. Their reward was several bags full of good garden manure! 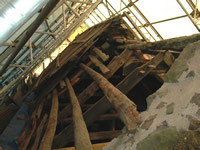 The first task the builders had to undertake was to make the working area safe. 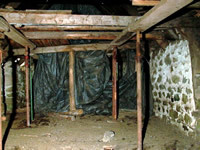 This involved getting props into place where the walls were collapsing and the roof bearing down on them. 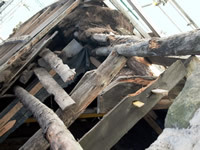 It was not long before all the roof timbers were resting on props and the serious business of removing debris and getting on to the roof to strip off the corrugated iron and expose the wall heads had begun. 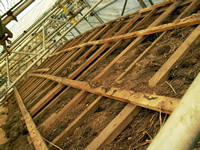 It was extremely heartening to see the roof that had been hidden from sight under the corrugated iron and to be reassured that the serious damage had been confined to the western extremity of the cottage. 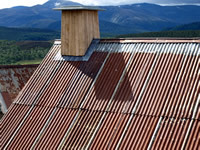 The architect's plan was to build a new frame to cover the original roof so that the corrugated iron could be relocated on top and the 19th century wok could be preserved under its protection. 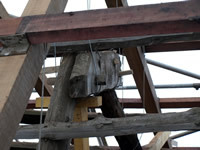 To ensure that the remedial work would stand the test of time the new frame was fitted into stainless steel shoes resting on the newly repaired wall heads. 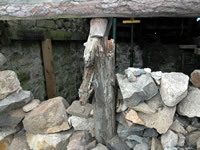 Having used good lime mortar to the same recipe as was originally used in the construction of the cottage the future of the house is assured. 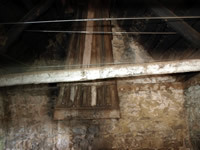 It was important to the conservation group that the attention to detail was of the highest caliber and at every stage the conservation engineer surveyed the work done to make sure that it was historically accurate and extremely durable. 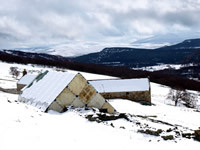 As was to be expected the rather open but wet weather of the winter 2007 had a sting in its tail and on the 10th April 2008 the work team found Auchtavan under a considerable snow blanket. 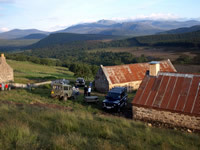 that was picturesque but provided some heart stopping moments getting vehicles laden with materials up to the site. 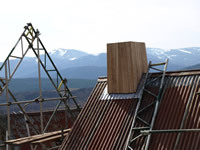 The sudden arrival of a late winter was no impediment to an intrepid work force and Ian Russell duly set about getting up on to the mill roof to carry out the repairs to the skews. 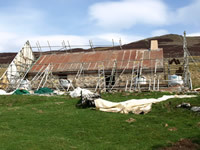 Fortunately, the weather soon relented and before long the work was going on apace in beautiful spring sunshine. 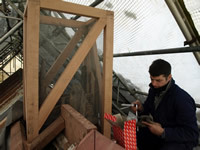 With the new lum in place on the roof the most precious part of the system, the internal hingin lum, only required a few replacement screws to make sure that it was going to remain in place in perpetuity. The only modern addition to the cottage has been the installation of stainless steel wires. 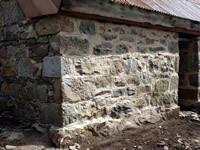 Having seen what, the wind can do up at Auchtavan, the only modern addition to the cottage has been the installation of stainless steel wires spanning the width of the building and anchored in to the newly stabilised walls. 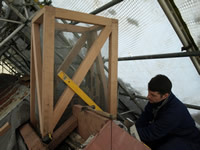 These tie back into the new roof frame so that the roof will now remain in place no matter what the wind does. 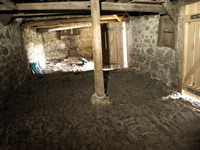 Whilst removing the evidence of longstanding residency by sheep a cobbled floor was discovered at the animals end of the cottage. So as not to damage this floor when cleaning it a compressor was hauled up to the site through the snow and the dried droppings blown out of the door. This left the floor in pristine condition. With new doors in place and the floors cleared one can now begin to get the feeling of what life must have been like living at Auchtavan. 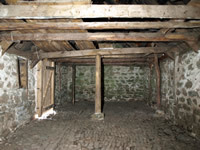 It is quite evident that at the living quarters end there had been a wooden floor and that the sleeping quarters were up in the roof space above the animals for warmth. 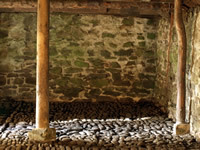 The hinging lum may be the most important feature of the cottage, but the quality of the cobbled floor where the beasts were lodged simply has to be admired. This was no mean feat and clearly done by someone who had a pride in their work. At long last in May 2008 it was time to remove the canopy and show the world what the team had achieved. The speed with which they dismantled what was a complicated framework was truly impressive. 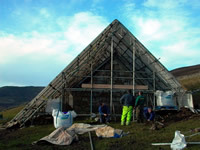 It was a grateful team that removed the canopy, having put it up in constant gales they could not believe their luck to be up on the roof in perfect May weather. They took no chances however and the speed with which they dismantled what was a complicated framework was truly impressive. 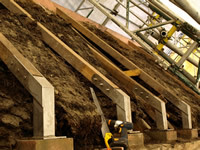 Every scrap of material used in constructing the canopy was recovered and has been recycled. It was a matter of great satisfaction that every scrap of material used in constructing the canopy was recovered and has been recycled into use in other projects. In the space of a few hours there was absolutely no evidence left of there ever having been anything other than the cottage there. The last pieces of the canopy to be removed were around the lum and there was a palpable sense of achievement when it finally came into view. 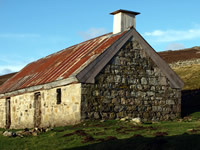 The solid roof and the sturdy lum, finally uncluttered and standing proud on the roof symbolised the achievement, against many difficulties, of a job well done. 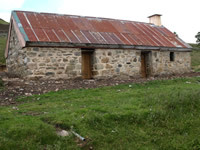 At last, looking as it did in the mid-19th century, Auchtavan is once more wind and water tight. Soaking up the afternoon sunlight the choice of site for the cottage demonstrates the local knowledge and craft skills of the original builders. 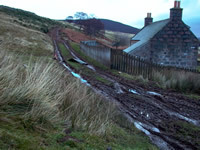 It was notable that the trampling of the grass around the cottage following many months of intense activity disappeared in a few days. 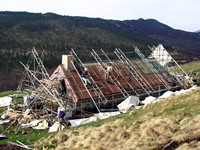 The west end of the cottage, so badly mauled by weather and wind is now a testament to the skill and dedication of the men who did the repairs. 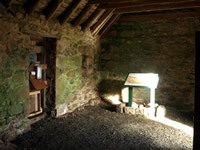 Whilst the great concern was the cottage, the horse mill is an equally important building and it too has been restored to house the interpretation of the site. Inside the building so as not to detract from the ambience of the setting the visitors can stop, learn and make comments in relative comfort. 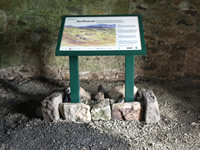 The information board with an artist's impression of Auchtavan in the past tells the visitor something of what has been happening up here and hopefully encourages them to learn more. 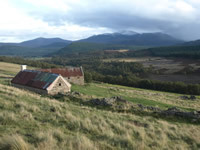 There is a lot to learn about Auchtavan and the surrounding area and the recording of the ruins and evidence of farming practices in the past is a rewarding activity. 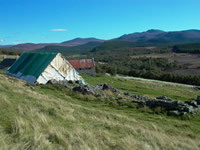 Once more Auchtavan is secure and tucked into its own bit of hillside, a monument to the people who struggled to wrest a livelihood from a challenging land. 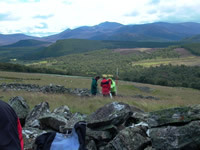 Auchtavan is now a place for people to come to and absorb the history of the land, looking out as it does over a now deserted glen, but one which has a fascinating story to tell. 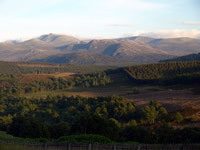 If for no other reason people visit Auchtavan, the views over the hills to the massive bulk of Lochnagar from the cottage will leave them with a memory that will last forever.